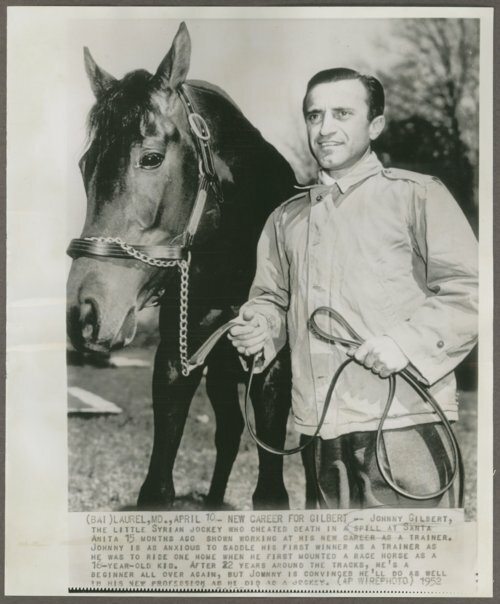 This Associated Press photograph from April 1952 is of Johnny Gilbert, the nation's leading jockey in 1932. Gilbert's 18-year riding career came to an abrupt end in January 1951, when he suffered a broken neck in a racing accident at Santa Anita. He was paralyzed initially, and the injury was feared to be fatal. He eventually achieved a ninety percent recovery but he could no longer ride. This photo marks the beginning of his new career as a trainer. Gilbert was born in Pittsburg, Kansas on August 6, 1914 with a birth name of John Dyer. He took the last name of Gilbert when he was adopted by Robert E. Gilbert, a Pittsburg veterinarian. He reportedly rode in his first races at the Crawford County Fair. As a jockey, Gilbert competed in 9,133 races and won 1,499 of them. His mounts earned a total of $3.4 million. In 1932, his best year, Gilbert had 212 wins. Johnny Gilbert died in California in 1973. The photo includes a typewritten caption and a Associated Press stamp on the reverse. This Associated Press photograph from April 1952 is of Johnny Gilbert, the nation's leading jockey in 1932. Gilbert's 18-year riding career came to an abrupt end in January 1951, when he suffered a broken neck in a racing accident at Santa Anita. He was paralyzed initially, and the injury was feared to be fatal. He eventually achieved a ninety percent recovery but he could no longer ride. This photo marks the beginning of his new career as a trainer. Gilbert was born in Pittsburg, Kansas on August 6, 1914 with a birth name of John Dyer. He took the last name of Gilbert when he was adopted by Robert E. Gilbert, a Pittsburg veterinarian. He reportedly rode in his first races at the Crawford County Fair. As a jockey, Gilbert competed in 9,133 races and won 1,499 of them. His mounts earned a total of $3.4 million. In 1932, his best year, Gilbert had 212 wins. Johnny Gilbert died in California in 1973. The photo includes a typewritten caption and a Associated Press stamp on the reverse.